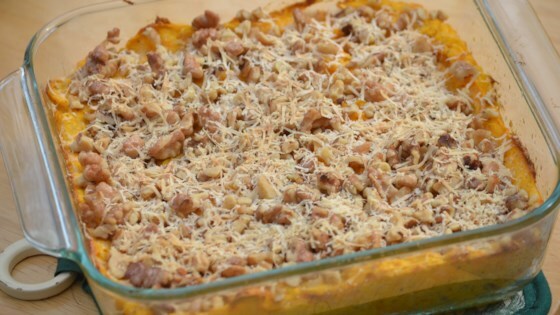 "Squash casserole that is wonderful! Great side dish for any meal." In a large saucepan over medium heat cover squash with water and cook until tender, about 10 minutes; drain and mash. To the squash add eggs, margarine, sugar, onion, salt and pepper. Mix well and transfer to a 2 quart casserole dish. Sprinkle bread crumbs on top. Great recipe - I steamed my squash and drained it very well. I used 1/4 c. butter instead of margarine. Will make a squash lover out of anyone. We loved this casserole. We have made it several times this summer. The kids didn't eat it but it left more for us. My husband mixed yellow squash and zucchini. This was great! I scaled down to 6 servings and added cheddar cheese in with it! Could not have been easier. DEFINITELY will make again!! Thanks!